Ubuntu Camp is a traditional canvas safari camp with a relaxed atmosphere and superb game viewing. It is a mobile camp and moves during the season to follow the great wildebeest migration. It is sited in the northern Serengeti from July to October and then in the southern Serengeti from December to February. 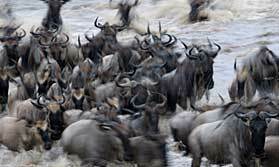 From May to mid-July it is in the Western Corridor, to witness the wildebeest crossing the Grumeti River. It is a small camp with just 8 walk-in canvas safari tents. These have en-suite bathrooms with flush toilets and bucket showers. There is a shaded veranda at the front where you can sit and enjoy views of the open plains. Days are spent on game drives in the national park, led by experienced guides. These take place twice a day in the early morning and late afternoon. Full day drives with picnic lunches can also be arranged. Walking safaris, fly camping and cultural visits are possible when the camp is in the southern Serengeti from December to March. Between activities you have time to unwind in the camp. There is a lounge tent which also houses the bar, a sociable area where you can mix with other guests and enjoy a cold drink. Convivial communal meals are eaten in the dining tent and you'll enjoy sundowners around the campfire. Open: Ubuntu Camp is open from 1st May to 15th July, 25th July to 15th November and 15th December to 15th March. Dates may vary slightly year to year. Location: Ubuntu Camp is a seasonal camp in the Serengeti, moving between 3 different locations each year to be in the best places for game viewing. From late July to October it is in the Northern Serengeti to coincide with the migration then moves, following the herds to the southern Serengeti from December to mid-March, about 15 minutes' drive from Kusini airstrip. The camp relocates to the Western Corridor from May to mid-July to catch the wildebeest migration crossing the Grumeti River. The closest airstrips are Kogatende (July-November), 1 hour away, Ndutu (December-March) 2 hours and Grumeti (May-July) 1 hour away. Rooms: There are 8 tents with en-suite facilities including flush toilets and bucket showers. Hot water is brought to the tent on request. There is a lockable box in each tent for valuables and a veranda with safari chairs and a table. Tents are double or twin and 2 can be made into triples if needed. They are set 20 metres apart for privacy. Your tent will be provided with mineral water, solar-powered lighting, a torch, insect repellent, a radio for emergency use and a a camp information folder. Activities: The main activity is game drives in the national park. From December to March, in the southern Serengeti, additional activities are available. These include walking safaris, off road driving, cultural visits and fly camping. Facilities: The camp has 2 communal tents, one housing the lounge and bar and the other being the dining tent, both offering great views of the plains. The camp gets great reviews for its food, which is of a consistently high standard. There is a campfire where pre-dinner drinks are served each evening. There is a bar offering a choice of drinks. Power is supplied by solar energy and a generator. There are battery charging facilities and a curio shop selling local handicrafts. The camp provides a laundry service each day. Dining: Meals are eaten communally. Breakfast can be taken before or after your morning game drive, you'll have a buffet for lunch, cakes with afternoon tea and later sundowners and snacks before a 3-course dinner. Soft drinks and local alcoholic drinks are included in the rates. Other drinks can be paid for locally in cash or by credit card. Children: Children aged 6 and over are welcome. Communication: There is free Wi-Fi internet access in a small tent near the main area. You can use the camp's satellite phone for US$6 per minute. Notes: The camp is not suitable for disabled guests as there are no special facilities. Explore north Tanzania inc. northern Serengeti (perfect for migration around July-Oct), then lovely Mafia Island. "David the camp manager runs a fantastic ship. The service, comfort and food provided were an absolute delight. The position of the camp was fantastic with frequent visits from passing wildlife." "We found this camp the best though this may have been as much to do with the gregariousness of the other guests there at the time (Aussies)as much as with the openness and friendlines of the staff. Warm welcome, attentive, details mattered (e.g. hot water bottles and leaving present key-rings! ).The food was better too."